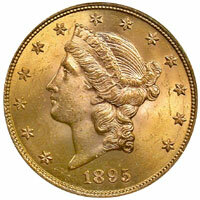 The prices of Classic US Gold Coins, those issued before 1934, were strong in the fall of 2009. As gold hit its temporary all-time peak in early December, I recommended that owners of such coins consider selling or at least swapping for low premium bullion coins and ingots. This call was almost perfectly timed. Since then, prices of many Classic US Gold Coins, in almost all grades, have dropped 10-35%. In his recent commentary, my friend Harry Miller, who calculates US coin values for the “Coin Market” section of Numismatic News, concurred with this evaluation when he lamented that Classic US Gold Coin prices had declined again. A month ago, I mentioned that I thought the price drops were nearly over. This week, I think it is safe to say that the pessimism has passed the peak. There are two reasons for this conclusion. Two weeks ago, at the ANA’s National Money Show in Fort Worth, I reviewed the Classic US Gold Coin inventory of several wholesalers and major coin dealers. Overall, I found a significant decline in the stocks of $2.50, $5.00, and $10.00 denominations compared to my experience in the recent past. This lack of fresh inventory is not that surprising. The spot price of gold has been setting all-time records in European currencies on a regular basis. For example, the price of gold in British Pounds and in the Euro set records on April 9. That means that the European dealers and banks that supply coins to the US market are unwilling to sell Classic US Gold Coins at the same prices (as figured in US dollars) they received a few weeks ago. Second, it looks like the spot price of gold may now be undergoing the major rise I have been expecting. As of the COMEX close on April 9, gold is up 6.7% from its close on March 24, the day before the US Commodity Futures Trading Commission held its hearings about the possible imposition of trading limits on gold and silver futures and options. As the price of gold increases, that puts pressure on the lower premium Classic US Gold Coins to rise in price. The lower grade $20.00 Double Eagles have already seen price increases in the past few weeks. For these reasons, shrinking supplies and higher intrinsic values, I expect prices of Classic US Gold Coins to generally increase in the coming month. If you were holding off acquiring these coins while trying to get in at the market bottom, I suggest you make your purchases now.